I have very few card collections given my limited resources and space, but I did decide some time ago to begin collecting on-card Royals autographs. It’s been a blast so far trying to track these things down and this is the latest addition to my collection. To view the cards currently in the collection, take a look at the Gallery or the other posts in this series. I’m working on getting a legit want list together on my trade page but, in the meantime, if you have any on-card Royals autos that it looks like I don’t have, don’t hesitate to drop me a line! Big fan of these. Big fan. As a kid card collector in the ’80s and ’90s, 1990 Leaf has a special place in my heart. Not only did the Frank Thomas and Sammy Sosa explode in value, but they also happened to be the only good looking cards made in 1990. Don’t believe me? Crack open your 1990 Score binder and get back to me. These cards were always out of my price range- even when they were brand new and not $30/pack (yes, I swear I saw some dealers selling at that price in 1998). Of course, I was 9, so anything over $.50 was a stretch of my lawn mowing money and my massive collections of hideous 1990 Topps and Donruss cards lives on as proof of that. I think buybacks get a raw deal as “cop-outs” in modern card sets. But I’ll take some Donruss Recollection or Topps Originals over some Golden Moments sticker autos any day of the week. 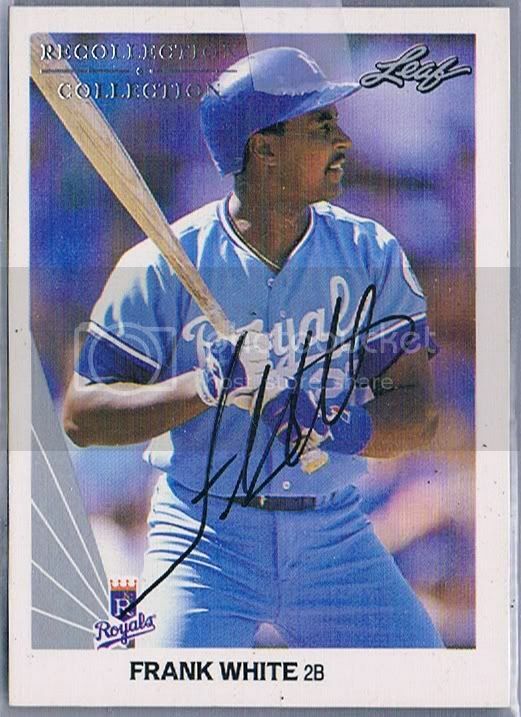 The autographs are on-card, the player selection is more varied (Frank White being no George Brett, but having his fans) and they tweak that little nostalgia gene that all ’80s and ’90s collectors have, even if they refuse to acknowledge it. Now, that’s not to say they can’t be overdone. I mean, a 1990 Leaf buyback auto of Frank White 4 years in a row is fun for no one. Nor am I really a fan of Leaf Ink or similar products that are all buyback autos (some with no indication of where they came from). But it does open some on-card doors and I’m all for that. Also, CheckOutMyCards currently has 40 1990 Leaf Larry Walker RCs in stock. A fine card but no substitute for the svelte Thomas. I’d forgotten the Walker was in the set. Surely, someone’s done a series of posts about what RCs are in each product, right? If they haven’t, maybe I’ll start- I love that stuff! 3 comments to Leaf Frank Alone! Frank is a classic. The cards of him, the better! Agreed- I’d love to see him in the Fan Favorites auto set this year!